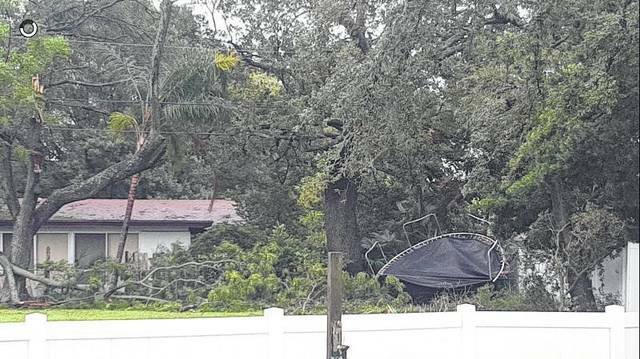 Photo courtesy Sarah VanAsdale Neumann This trampoline had just purchased a few months ago by Sarah's son, who lives in Clearwater. It ended up wrapped around a neighborhood tree. 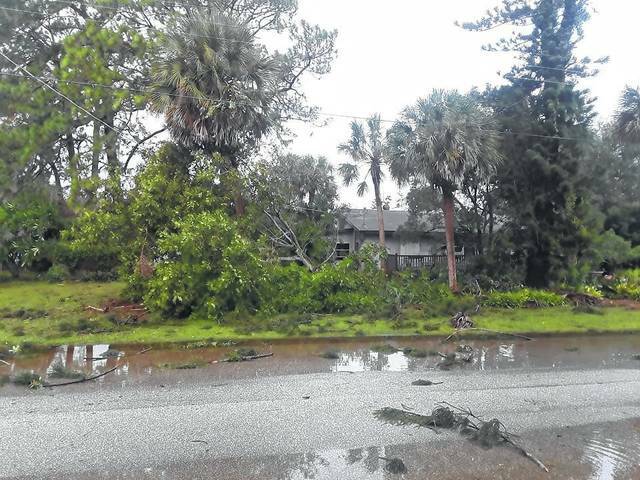 Photo courtesy Mike Jones Mike Jones shared this photo of a house bombarded by tree limbs and debris as Irma passed through. Photo courtesy Mike Jones But ones, like many, were doing the best they could the morning following the storm. 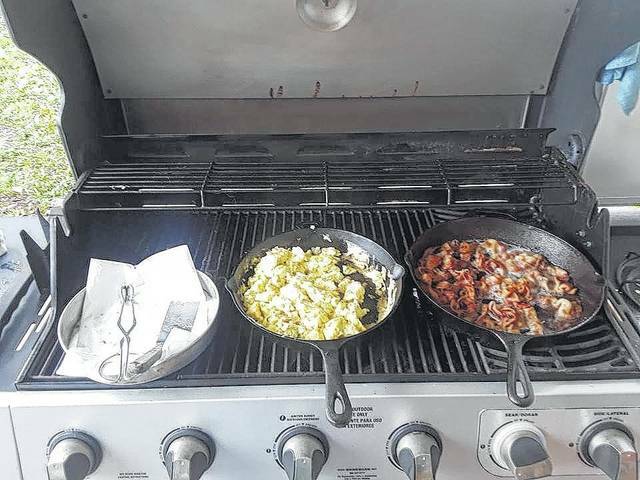 A grill worked just as good as a stoveop to cook breakfast. 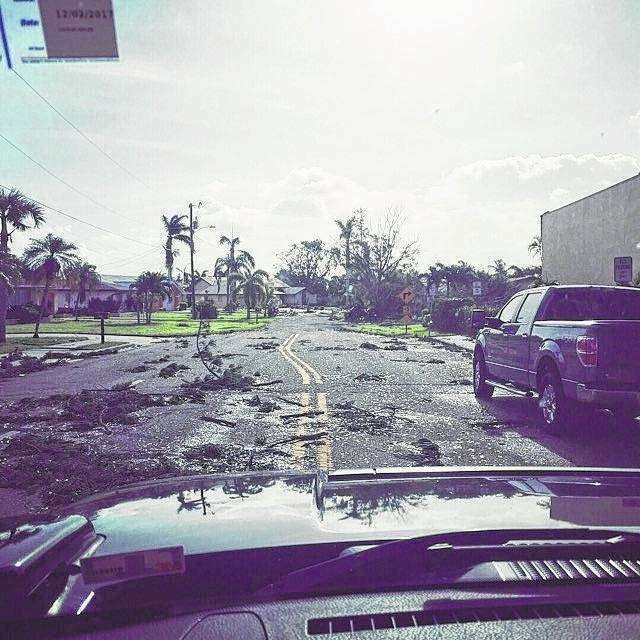 Marc Ruehle, a 1993 Galion grad shared this photo of Cape Coral, Florida, where he weathered the storm with friends. Photo courtesy Marc Ruehle When he returned after the storm to Fort Myers, he said there was lot of damage. There were also looters, so the sounds of chainsaws and generators were also joined by police helicopters and sirens. Mike Jones Mike Jones shared this photo of Irma damage in Bradenton, Florida. 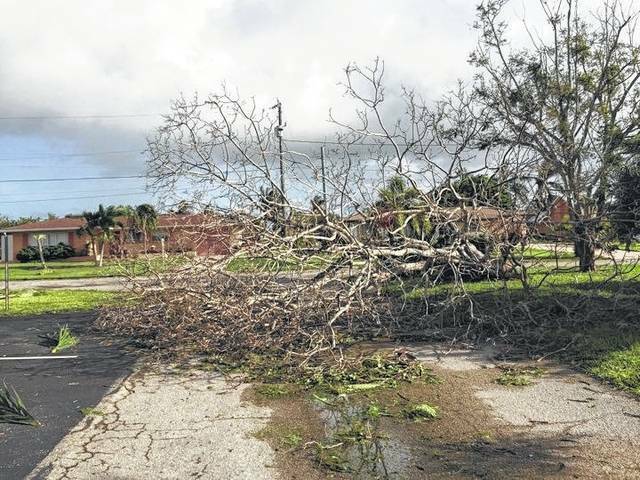 GALION — Hurricane Irma left a devastating trail of destruction from the Caribbean to Georgia and beyond. But Galion area residents who have relocated to points south, although they talk about damage and lack of electricity and the mess that will take weeks to clean, they’re most often using words like hope and thankful and safe when they describe this weekend’s storm. Sarah VanAsdale Neumann is a 1978 Galion High School graduate. She lives in Tarpon Springs, on Florida’s west coast. On Monday, via social media, she said: The worst is over for me. I live about 12 miles west of Tampa in Tarpon Springs. We stayed, put up hurricane shutters…although the eye did not go directly over us, the wind was terrifying at 2 a.m.
As with many in the Irma’s path, family and neighbors stuck together. “Our youngest son stayed with us as his house had no protection. We took in our next door neighbors — two adults, two kids and a 70-pound Doberman. Both of Neumann’s sons live in Clearwater. One son lost a trampoline and there was tree damage. The trampoline wasn’t actually lost, it was wrapped around a tree by the wind. The second fled north to get out of harm’s way. Pauline Harris Eaton is a 1979 graduate who lives in Orlando. During the storm she said feeling and hearing the winds and gusts were scary and she and her husband Archie Eaton, also a Galion graduate, could see and hear transformers blowing up on utility poles in the area. “I am not a fan of hurricanes,” Pauline said. Sandy Clouse Mansfield is a 1977 Galion graduate and lives in Arcadia, Florida and is married to Jim Mansfield, also a Galion graduate. Jim is one of the sons of Dr. Bernard Mansfield of Galion. The Mansfield family had a home in St. John that was destroyed by Irma a few days before it hit Florida. Clouse welcomed family from Naples to stay with her during the storm. They said they will be without power for several days. Kim Flick Wilson lives in Debary Florida and rode out the storm with some relatives in her home. Boomer Balliett, a 1978 Galion graduate, lives with his family in St. Petersburg, Florida. Cindy McClenathan Sharp lives in Lakeland, Florida and is a 1978 Galion graduate. “We did not evacuate. If we could have evacuated, there was nowhere to go other than getting stuck on highways that were also in the path of Irma. We stayed in our home and hunkered down. We lived here when Hurricanes Charlie, Jeanne and Francis hit. Those three coming through back-to-back was nothing compared to Iris. Cindy is a supervisor for crime prevention with the Lakeland Police Department. The storm was bad enough that police officers hunkered down, too until the storm passed. Mike Jones is from Galion and lives in Bradenton, Florida. He was pretty low-key about the storm. “It wasn’t too bad, 100 mph gusts and a lot of trees and roof damage. All in all we were very lucky,” he said. Karl Anschutz is a Galion graduate and a former Galion police officer. He lives in Brooksville, Florida, about 40 miles north of Tampa, but didn’t stay there during the storm. He and his wife Pam left Friday night and headed north. “We found ourselves stuck in traffic for eight hours. Once we got to Interstate 10, we found a roadside rest area. We slept in our car for about four hours. We then drove to Tallahassee, then up to Dothan, Alabama. We kept checking on rooms, which none were to be found. We then headed to Monroeville, Alabama, where we found a room, which was the last one they had. Marc Ruehle is a 1993 Galion High School graduate. He lives in Fort Myers, but stayed with friends during the storm in Cape Coral, prior to that, he lived on the Island of St. Maarten for a few hears. He said looters were busy breaking into buildings in the city, and that made for more confusion as others were trying to check on damages and loved ones. This trampoline had just purchased a few months ago by Sarah’s son, who lives in Clearwater. It ended up wrapped around a neighborhood tree. Mike Jones shared this photo of a house bombarded by tree limbs and debris as Irma passed through. But ones, like many, were doing the best they could the morning following the storm. A grill worked just as good as a stoveop to cook breakfast. https://www.galioninquirer.com/wp-content/uploads/sites/38/2017/09/web1_Ruehle-photo.jpgMarc Ruehle, a 1993 Galion grad shared this photo of Cape Coral, Florida, where he weathered the storm with friends. 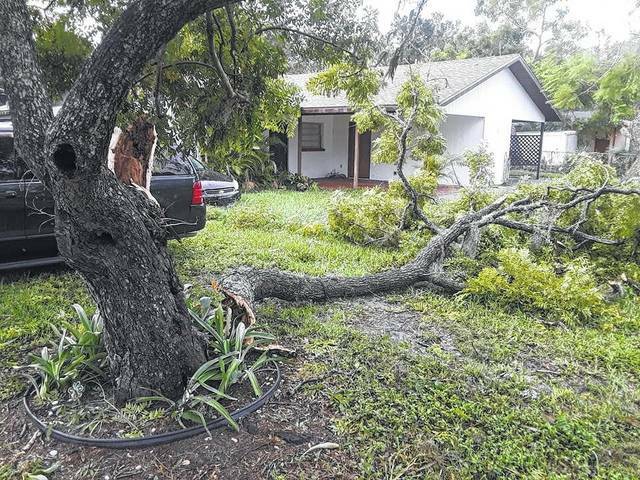 When he returned after the storm to Fort Myers, he said there was lot of damage. There were also looters, so the sounds of chainsaws and generators were also joined by police helicopters and sirens. Mike Jones shared this photo of Irma damage in Bradenton, Florida. Email Russ Kent with comments or story ideas at rkent@aimmediamidwest.com.